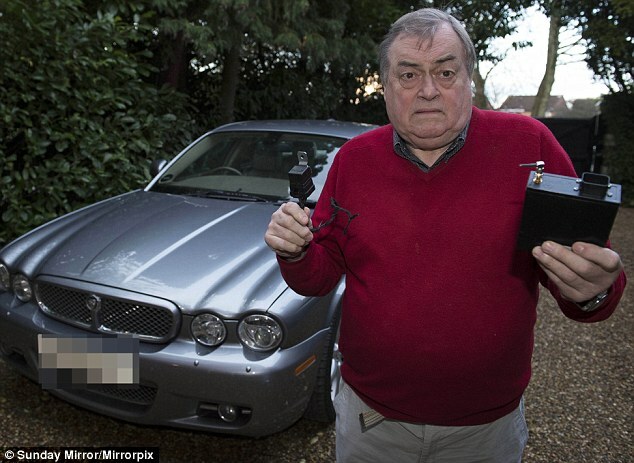 John Prescott has launched an investigation into who has been bugging his beloved Jaguar.The former Deputy PM, dubbed ‘Two Jags’ for his love of the luxury model, was stunned to discover a tracker device planted under the driver’s seat. The device also has a built-in microphone which means it could have been recording all of the Labour heavyweight’s conversations. Lord Prescott has owned the car for several years but the bug was only discovered after he had problems starting it. He took it to a local garage and mechanics unearthed the 6-inch black box under the driver’s seat. It uses mobile phone technology through a built-in SIM card to keep track of the car’s every move. The 76-year-old told the Sunday Mirror: ‘I’ve been told that whoever knows the SIM card that goes with the tracker can send out a signal and stop the engine. I suppose you have to hope you’re not on the motorway. ‘I’m really surprised. I’ve had the car a couple of years and had considerable trouble with the battery. ‘Something was draining the power and affecting the operation of the vehicle.